Costa Rica is the land of biodiversity and the abundance of wildlife is often people’s first reason to visit this beautiful country. 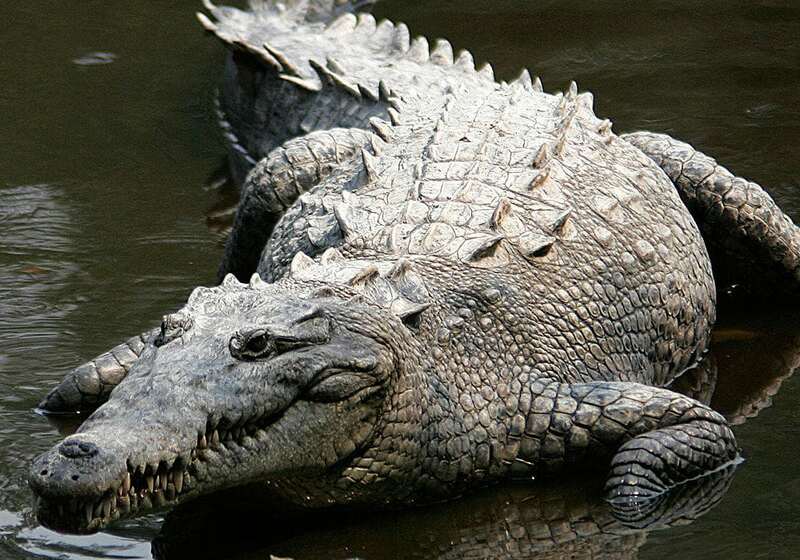 The long list of fascinating creatures also includes a wide range of crocodiles and caiman. With the average crocodiles in Costa Rica reaching sizes 2 to 3 meters and the caiman between 1 and 5 meters, you won’t have too many difficulties spotting them. That being said, it can be easy to confuse a floating piece of driftwood for a crocodile. Because issues with hunting, loss of habitat and pollution, the crocodile population had been dwindling. In some areas in Central America and the rest of the continents, they were even considered endangered. In Costa Rica they currently hold the status of Vulnerable while the caiman has moved up to Least Concern. Crocodiles and caimans are carnivorous and eat only meat. They will eat anything they can get catch from birds to fish, iguanas, turtles, deer and yes, even humans. They tend to frequent river beds and can lay in the sun for hours to get their body temperature back under control after hunting in the cold waters. Due to their tolerance of salt water, crocodiles are pretty flexible when it comes to their living area. They reside in rivers, swamps, lagoons, small islands, and have been known to come up onto the beach every now and again. Caimans are a little more picky about where they want to live and are mainly found in rivers, mangroves and canals. Crocodiles are the only reptiles to maintain a nest after they lay eggs. They will either dig smaller holes in which to lay the eggs, or create what is called a mound nest where the eggs are covered with mud and dirt that will harden and create a protective layer. The best spot in all Costa Rica to see crocodiles is the Tarcoles River Bridge. Here you won’t just see a couple of crocodiles, but hundreds of them. Tarcoles river is located on the road towards Jaco on the Central Pacific side of Costa Rica. It isn’t a beautiful river but certainly it is amazing to see the monsters below. You can also take the famous Crocodile Man Tour on this river! Some of the most popular spots to see these caimans are in the canals of Costa Rica. Tortuguero is one of the most popular points to see them, they thrive within the Canal waters edge. You can also travel down towards the Sierpe Wetlands, where they thrive in the wetlands and canals. Palo Verde National Park isn’t only a great birding destination. You can also take a boating tour just to see crocodile and caiman drying in the sun. The two species don’t really like to mix and mingle but and are very territorial. So, where you see crocodiles you generally won’t see caimans. 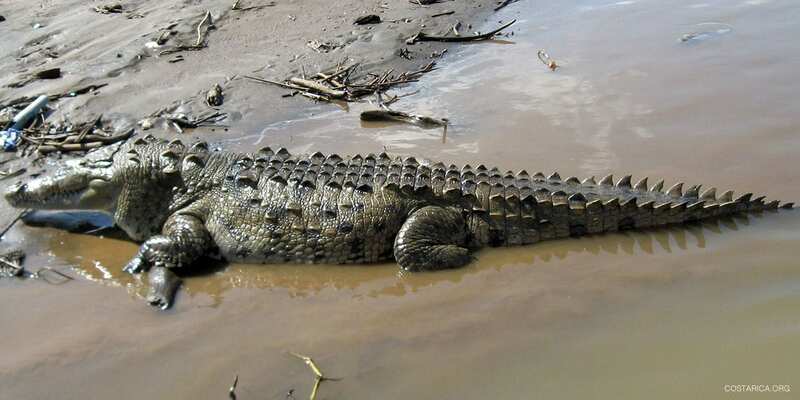 The American Crocodile or Costa Rican Crocodile can get very big indeed with sizes reaching up to 4 meters. Normally they aren’t very active and bathe in the sun all day. But when it comes to feeding-time, you can see that this 1000-pound mammoth can still move pretty quickly. Both the crocodile and the caiman have a laterally compressed tail, but they differ in their size and the shape of their snout. Caimans and alligators are smaller than Crocodile but can still grow a fair size. 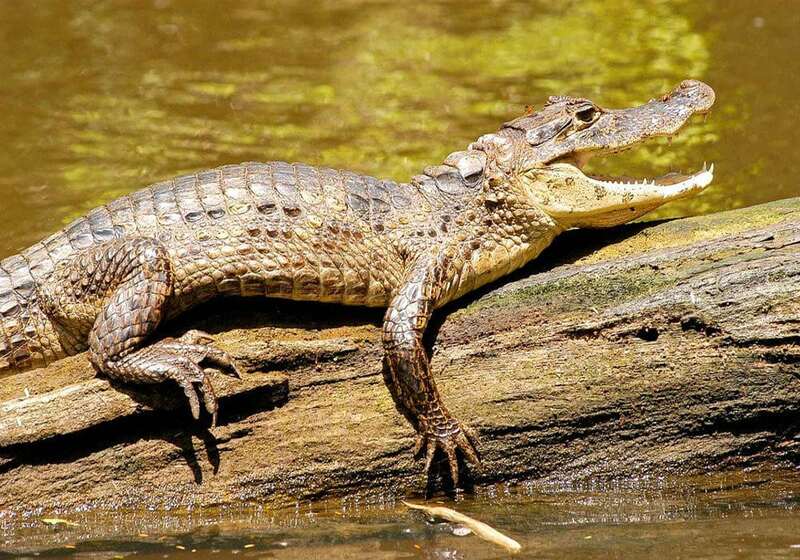 They differ from crocodiles physically in that they have a shorter and wider snout. It is also possible for you to spot the caiman crocodilus, or the spectacled caiman. Considering their smaller size, caimans are more agile than crocodiles. Crocodiles and caimans are dangerous to humans. You have to take some precautions when trying to spot them and also when you want to avoid them! Chances are you are in for a bit of fun that doesn’t involve you seeing a giant crocodile. And there are certain places in Costa Rica where you won’t really expect to see them and where you should take extra care. They might not specifically hunt for humans, but they won’t hesitate to catch an easy prey! The popular coastal town of Tamarindo, affectionately called Tamagringo by locals, has some of the highest tourist rates in the country. But what a lot of tourist don’t know, is that the sterres running along the beaches are also a popular hangout for crocodiles. Like we said, the crocodile can resist salt waters and so has no problem hanging out at the beach. So keep a keen eye out when you are visiting the beach and definitely don’t cross the sterre when the tides are high. Tamarindo is getting a special mention but any beach with nearby sterres and rivers should be one where you are extra careful. Even beaches like Jaco and Playa Grande (Las Baulas) have had reports of regular sights. In fact, there are annual reports of tourists being attacked on the beach, sometimes killed. – Keep your hands inside at all times: Crocodiles and Caimans usually stay clear of boats but sometimes they stick around. Make sure you keep your hands and feet inside the boat at all times. – Do not feed the Animals: This goes without saying, but avoid interacting with the animal in any way. – Always use a guide: The best way to spot them in full safety is to use a licensed guide. They can give you proper direction to remain safe and see many of these amazing creatures. We can help with that!